I created this method to learning and improving ones game out of necessity. I learned early on that only way my students stuck with it was through lowering their scores and enjoying the game. Unfortunately, many pros have their students spend much time working on the “perfect” swing and attempting to get more consistent that they forgot the objective - building a game you can take to the course and succeed. My Swing – Score – Play method will actually teach you how to lower you scores and hit the right shots on the course. I am very excited about this way of learning and you should be too! The swing fundamentals (GPA) are time tested simple truths that anyone who willing to put in the time can learn and apply. It just takes some time and patience. When you learn to accept your swing and quit trying to swing like a tour pro and put the club into “positions” you will improve. Positions are created by having a solid swing motion, you can do it! 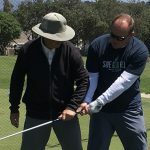 There is a specific way you should swing a golf club and advance the ball, I can help you get to where you want to go!! SCORE - Key to lower scores! I believe the game of golf when learned properly should start at the hole and move backwards to the tee. Putting itself is 43% of your score and shots inside 100 yards make up 65% of the score. Once you learn the proper technique and understand the scoring strategies, your scorecard will be a lot more pretty to behold and you will be a happier golfer! PLAY - It's fun to play golf! Once you stop worrying about making a perfect swing, you can begin to truly appreciate and learn how to play golf. On the course, we go over how to get the ball around in the least amount of strokes by making less mistakes, improving our chances of birdies and scratching out pars that used to be bogeys. We'll develop a pre-shot routine. Tell ~ Show ~ Just swing it! On the course is the best place to evaluate your game, I get to see the students strengths and weaknesses while playing. This way we can create some goals, a practice plan, and your roadmap to success!